In the money market of the Monetary Approach to Balance of Payment (MBOP), the central bank controls the nominal money supply (MS). Given the average price level, the nominal money supply (MS) divided by the average price level (P) defines the real money supply (mS). 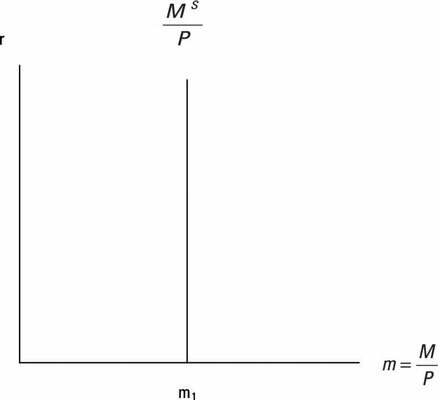 The following figure shows the real money supply as a perfectly inelastic curve. Additionally, the central bank controls the nominal money supply. Therefore, the nominal money supply is one of the ceteris paribus conditions along the real money supply curve. A perfectly inelastic (vertical) curve indicates that the curve has an x-intercept. In other words, the curve is associated with a given level of the x-variable, in this case, the real quantity of money. A perfectly inelastic curve such as the real money supply curve also indicates that the real quantity of money (m1) does not vary with the real interest rate (r). The real interest rate can be higher or lower; the x-intercept or m1 remains the same. In contrast, a perfectly elastic (horizontal) curve has a y-intercept. This time, there is a level of the real interest rate that doesn’t respond to changes in the quantity of real money (m) on the x-axis. The perfectly inelastic (vertical) real money supply curve may seem surprising. This particular real money supply curve implies that the central bank focuses on the quantity of money as the monetary policy tool. In recent decades, most central banks use a key interest rate (such as the Fed’s Federal Funds Rate) instead of the quantity of money when conducting monetary policy. However, for our purpose it does not matter whether the real money supply curve is perfectly inelastic (the central bank’s policy tool is the quantity of money) or perfectly elastic at the given interest rate (the central bank’s policy tool is a key interest rate). The classical–neoclassical school: This school relies on the Quantity Theory of Money. This theory predicts that the changes in the price level equal the changes in the nominal money supply. In this case, a positive relationship exists between the changes in the nominal money supply and the price level. Therefore, if a central bank increases the nominal money supply by 5 percent, it creates 5 percent inflation. The classical-neoclassical school relies on the long-run view. In economics, the long-run represents the run, during which all nominal variables adjust. 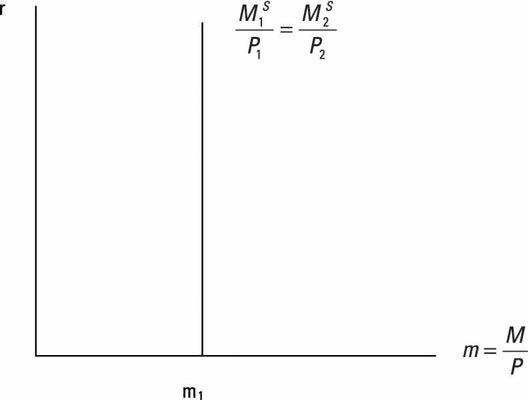 The following figure illustrates the situation in which the nominal money supply has increased from M1 to M2. According to the long-run view, the average price level increases at the same rate from P1 to P2, leaving the real money supply unchanged (m1). The Keynesian school: You may have heard about Keynes’s famous phrase: “In the long run, we are all dead.” Clearly, Keynes did not care much about the long-run analysis that assumes that all nominal variables adjust. Instead, he introduced the notion of the short run, during which a nominal variable remains sticky. A sticky nominal variable is a variable that does not change, per definition, during the short-run. The MBOP assumes that prices of goods and services in an economy are sticky. Various explanations seek to tell why prices are sticky. These explanations can be summarized as menu cost. Basically, menu costs imply the assumption that frequently changing prices of goods and services are annoying to consumers. Therefore, firms may not change the prices of their products every time their production costs change. They may wait until the current price is no longer sustainable at their new cost structure. However, note that when firms adjust their prices (upward or downward), the average price level remains sticky at a new level. Assuming sticky prices, if a central bank increases the nominal money supply, the real money supply increases. 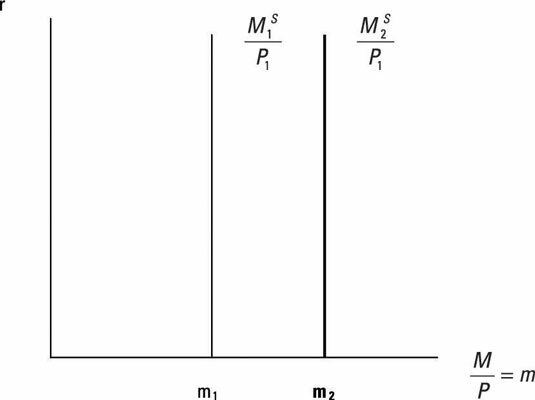 The following figure shows this result. The initial nominal money supply, M1, increases to M2. Because prices are sticky in the short run, the initial price level, P1, remains the same after the increase in the nominal money supply. Because you are dividing a larger number (M2) by the same price level (P1), there is an increase in the real money supply curve. Similarly, if there is a decline in the nominal money supply, assuming sticky prices, this time the real money supply declines, decreasing the real money supply curve. Both the short- and long-run analyses are applied when there is a change in the nominal money supply.